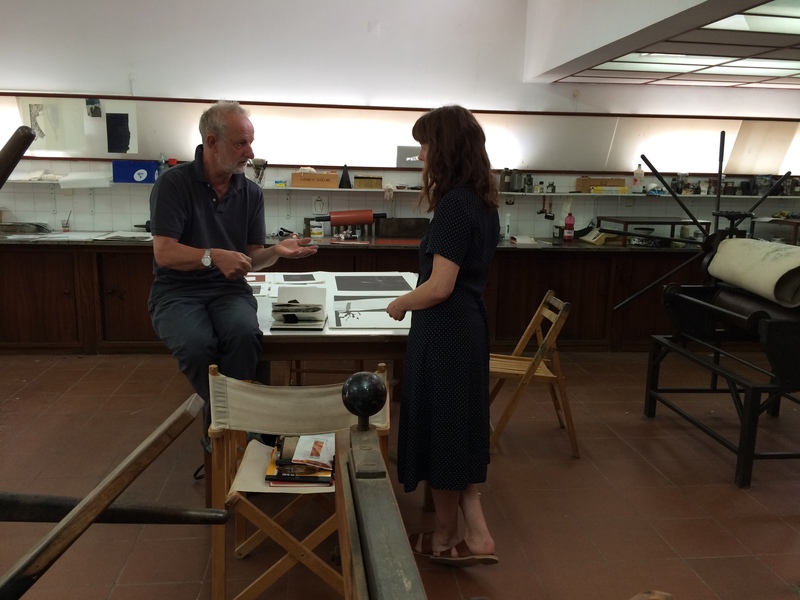 Continuing the annual residency at Oficina Bartolomeu dos Santos (OBS), this year’s winner was Isabel Wilkinson, who spent 2 weeks in early October 2015 creating new work in the studio in Portugal. ‘I use printmaking to create new semi-imagined landscapes, informed by film, fiction and lived experience of place. Through drawing and collage, I attempt to fragment reality through the abstraction of landscapes. I often underpin a body of work with a narrative taken from mythology or fiction. I like to explore the possibility that the stories we read, hear or watch begin to inhabit our real world, and to find the space created by this collision of real and imaginary. Arriving in Tavira just before sunset, the rare beauty and peacefulness of the town and the studio was breathtaking. I could hardly wait to get out my drawing tools – in the morning I began to sketch the stark white buildings and long shadows that characterize the landscape of the town. Talking to Margarida Palma, who helps to run the Oficina Bartolomeu dos Santos, I found out how particular Barto dos Santos was when designing the studio. Each feature was considered, down to the design of the windows and the placement of the sinks, to suit his way of working. The pleasure of living and working in such a well-equipped and beautifully located workshop is borderline luxurious, a printmaker’s paradise. 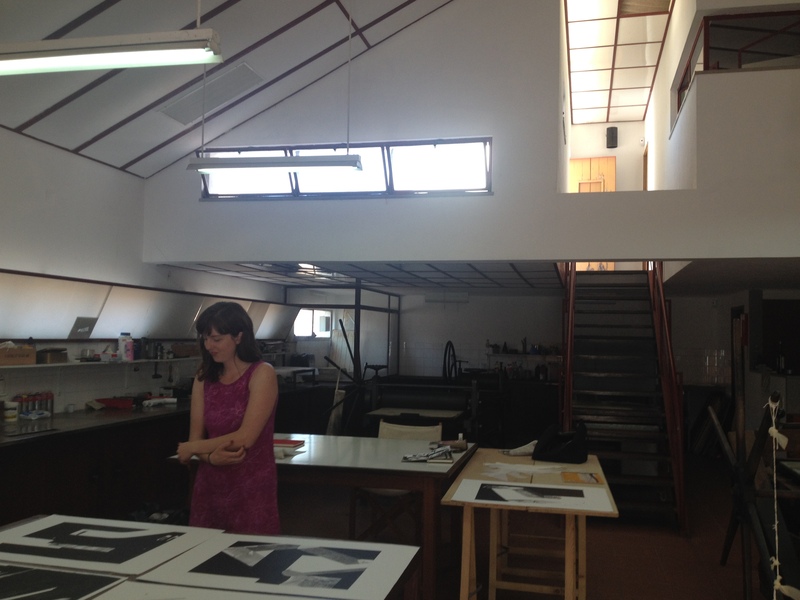 I was struck by Margarida’s passion for printmaking, and for the development of this space – in fact everyone connected to OBS shared this passion. Barto left an incredible and generous legacy in his studio, and I felt incredibly lucky to have use of it – and also honoured to play a role in the continued life of the building. Spending time alone in Barto’s studio was an incredibly reflective and productive time for me. The solitude of the first week forced me to reflect on the direction of the body of work I would make while at OBS – having recently completed my MA and taken part in the AYYO Residency in the Cotswolds, this was an important time for me to assess where I am going next in my practice. I also found out while at OBS that my work had been shortlisted for the 2016 Clifford Chance Postgraduate Printmaking Exhibition, and I felt as though my practice had now transitioned to beyond study and into real life. In the second week I was joined by Professor Paul Coldwell. We looked over the prints and drawings I had been working on so far, and Paul gave feedback and suggestions on these. Having worked exclusively with monoprinting for the past 18 months or so, Paul encouraged me to be more experimental with my approach and to think about making some editions. We also discussed at length the process of adapting to life after MA study, and I feel more confident now to run with ideas and developments in my practice, while maintaining one of the most constructive aspects of postgraduate study – conversation and debate with peers. This entry was posted in Staff, Students and tagged Barto, Isabel Wilkinson, MA Printmaking, OBS, Oficina Bartolomeu dos Santos, Paul Coldwell, Tavira on October 23, 2015 by Claire.